This 12-volt battery has been designed to fulfill rigorous Power Wheels requirements in order to provide the best possible performance, durability and maximum play time for Power Wheels® vehicles. It is fully rechargeable and has a built in circuit breaker. Get that vehicle back up and running with a new power source or have a spare for when friends come over! If your vehicle has a 12 Volt Battery with an orange top, this is the battery to replace it with. This fully rechargeable battery will have you back up and running in no time and it is always great to have a spare. Call or email with any parts questions. This replacement battery is for use with the following Power Wheels® vehicles: Type H 6-volt; Type H or Type A for Super 6-volt; and 12-volt vehicles (Preschool & Advanced Series only). Thermal fuse included for safety. 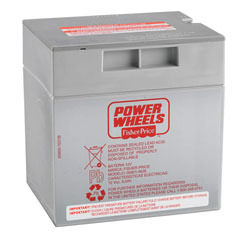 Fisher Price 6 Volt 4Ah Battery for Toddler-Size Vehicles. Bring your child’s rider back to life or have a spare for those longer trips around the living room! This 12-volt battery charger is a genuine, original Power Wheels part and will fit the 12-Volt cube-style batteries. Unique “probe connection was specifically designed to fit your existing vehicle battery. Fully Automatic, will not overcharge your battery. 6 Volt Red Battery Charger. If your child’s vehicle uses one Red Battery, this is your charger. Fully automatic, this charger is Authentic Fisher Price and will not overcharge your battery. DeWalt XRP Batteries are high capacity versions of DeWalt’s Legendary 18 Volt Power Cells. Not only do they have longer run time so you can do more work before re-charging, but DeWalt 18Volt XRP batteries will fit any DeWalt 18 Volt Tool (drill, cutoff saw, impact driver, etc).